Since 2007, Balbriggan Community College is linked in a special way with Trinity College Dublin. The Trinity Access Programme (TAP) provides a range of initiatives which help enhance the educational experience, foster a love of learning, and increase access to and participation in third level. Over the years this programme has had a significant impact on those of the student cohort who participated. Following 20 years of providing Access initiatives, TCD have now broadened their remit and have partnered with CFES/US and Google. As a TAP linked school, Balbriggan Community College is now part of this new and exciting opportunity to reach a broader cohort of our student body in creating a vision of College for every Student, within a 21stCentury teaching and learning environment. 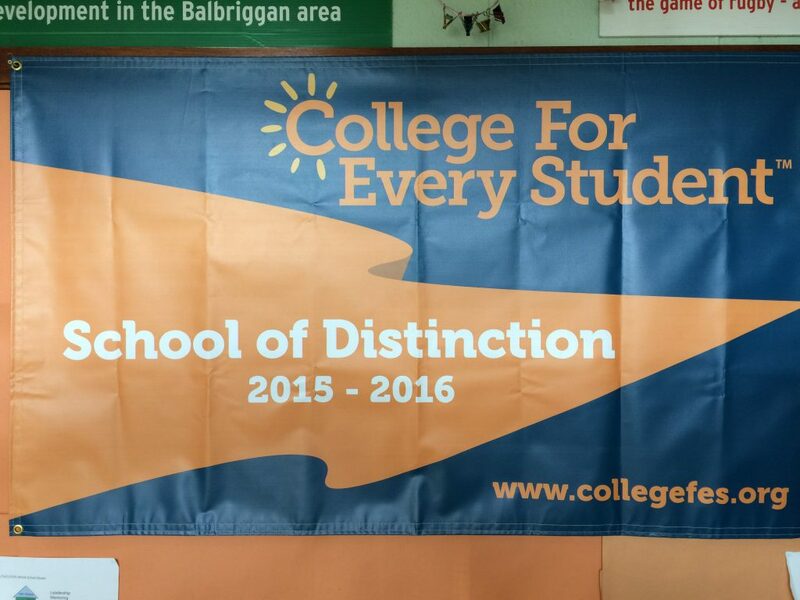 Balbriggan Community College is now in year 3 roll out of this programme. This is a research based initiative, providing information on its impact. A core value includes assisting our students in overcoming any barriers to fully accessing educational opportunities. CFES programme targets 100% of student cohort in raising expectations and creating future visions, using a whole school guidance model. The initial results are very exciting, evidencing impact of roll out of this programme to date. The research focus has been on the student cohort who entered our school in 2012, but is also inclusive of whole school. Following all the hard work of all our staff, students, alumni and whole school community we are very proud of our achievements and are delighted to announce that we are in receipt of International School of Distinction Award 2016. CFES School team plan and roll out a series of pillars to engage both the Scholars ( Year 4- 2016) and whole school community. This involves a broad range of activities involving students, teachers, college mentors, parents, student support services, TCD personnel, CFES/US and Google. TCD provide funding to each linked school to support roll out of the programme. The programme provides for continual engagement and involvement in CFES related activities, including attendance at CFES conference. CPD is provided for staff in a variety of formats, both for whole staff, and those who wish to avail of Foundation course in TA21, followed by Masters in 21st Century Teaching and Learning. Our college website captures key elements of this programme.